Feeling a little anxious to get through those doors? No worries, we understand. Are you ever open during the week? Unfortunately, we are closed, except for private events during the week. Any special events (luncheons, receptions, galas, fundraisers, weddings, etc.) can be arranged at your preferred date & time, which is also subject to availability. Glad you asked! 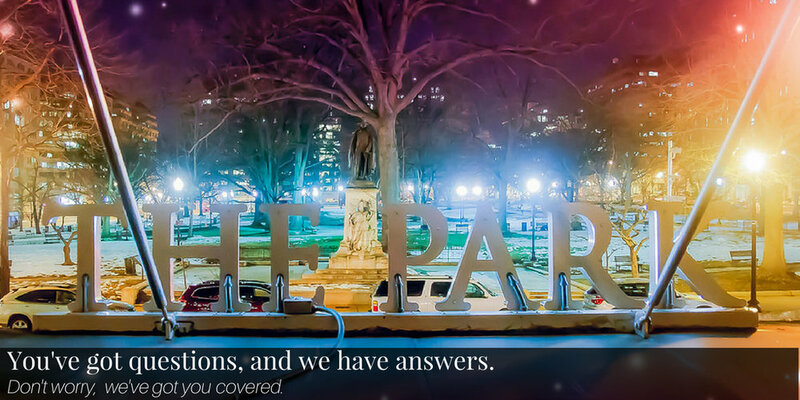 You can reach our main line at (202) 550- 0300 or email at info@Park14.com. We generally require all guests to be 21 years of age or over. You can book your event by contacting us at events@park14.com. Bottle Service Table Reservations number: (202)262-3939. The Park can be accessed via the McPherson Square stop on the BLUE and ORANGE lines. Use the 14th & I St exit and walk north ½ block on the west side of 14th St to The Park. Does The Park offer valet parking? Please click on the Upcoming Events tab under the Nightlife menu for up-to-date information on nightly events. Click here to go there now. On Thursday, Friday and Saturday there is usually no cover charge between 5-10pm. On Saturday, there is a cover charge starting at 10pm. The regular cover charge is $20. Times and amount of the cover charge are subject to change on any given day due to special events. Does The Park have a lost and found? If you leave or misplace an item at The Park, please email info@park14.com and/or call or text 202-262-3939 or 202-425-8080. Please leave your name and a contact phone number with a full description of what you lost and when. We accept American Express, Visa and Master Card. We do not accept gift cards or any cards that are not imprinted with the cardholder’s name. Does The Park have a happy hour or other specials? The Park has happy hour from 5-7pm on Thursday and Friday featuring nightly food and drink specials. Click here to view our Happy Hour Menu. How do I book a reservation for a large party? We only take dinner parties for up to 8 guests. Large parties will require a pre-paid semi private or private space rental. For assistance with large party reservations, please call (202) 425-8080. Does The Park serve dinner? How about lunch? Yes we serve dinner on Thursdays and Fridays from 5:00-10:30pm. We are not open for lunch, however, The Park is available during the day for private luncheons, meetings, retreats, team building activities or other functions upon request. Does The Park serve Brunch? Yes we serve Brunch on Saturdays starting at 3pm and Sundays starting at 1pm. Reservations can be made by clicking Reservations under our Restaurant tab. Or you can click here. After 10pm, all seated areas in Park are available for bottle service only and can be reserved with the required minimum liquor spend. Please call the bottle service/table reservation line at (202)262-3939. If there is no answer, please send a text message to that number AND an email to bottleservice@park14.com. Be sure to include your name, contact number and email, desired date, how many guests, and any other pertinent information. How can I get further information on corporate events and catering? For further information, please contact Rebecca Morris our Assistant Director of Marketing and Sales at (202) 815-4232. For all additional inquiries, please contact events@Park14.com. Questions about cupcakes and other desserts? The Park will no longer allow cakes, cupcakes, or any other outside desserts to be brought into the venue. While we can appreciate your enthusiasm in planning the details of your special occasion, please understand that, in respecting the collective enjoyment of all guests, we cannot allow balloons, confetti, decorations or gifts in the dining room. How do I apply for a position at The Park? We are always looking for great additions to our team. Please email your resume to jobs@park14.com. You can also visit our careers section under our about menu for more details. Or you can click here. Please send your submissions to The Park via email to info@park14.com. Where can I view event pictures? You can view event photos from The Park on our Gallery Page. I'm coming for an interview. Where should I park? Anyone coming to Park for an interview, MUST park in the neighboring garage. You cannot park on the street. We do not know how long your interview will take, and we are not responsible for parking tickets.